This is a different sized card, and I love making them. It's fun to change things up a bit! You start with a 6" x 6" piece of cardstock and fold in half. The final dimensions of the card is 6" x 3". These cards fit perfectly in our Small Open-End Envelopes (p. 167 of catalog). My stamp club gets to make either a free scrapbook page or card every month, and this is the card they can choose for this month. This is the first time that I've been able to play with this set (Only Ovals), and I really like it. I actually earned this set free! I love free stamp sets! 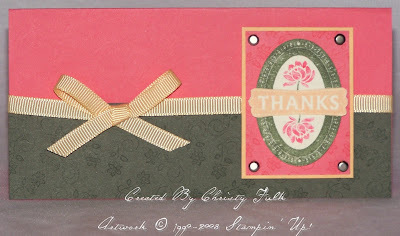 Supplies: Only Ovals & Boho Backgrounds Sets; Cameo Coral, Always Artichoke, Apricot Appeal, & Very Vanilla Cardstock; Always Artichoke, Cameo Coral, & Apricot Appeal Classic Ink Pads; Cameo Coral & Always Artichoke Stampin' Write Markers; Apricot Appeal 1/4" Grosgrain Ribbon, Vintage Brads, Wide Oval Punch, Paper Snips, & Crafters' Tool Kit. The Cute Owl is Back! The Month is Coming to an End! Last Day to Sign-Up for Christams SAS! Last Day to Sign Up!